I did make some progress in the sewing room this last weekend, although not as much as I was hoping for. Isn’t that always the case? 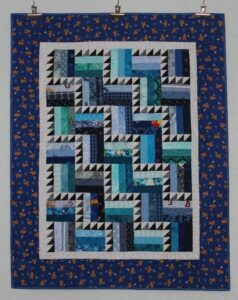 The binding and the sleeve on the Stair Steps baby quilt (29 1/2″ x 37 1/2″) was finished Friday evening. This is my 12th finished quilt for the year – only 13 more to make my 2017 goal. The remaining checkerboard blocks for Long Time Gone and the Rainbow Braids were Saturday’s projects. I decided to put a solid black sashing strip between the braids and found some fabric from my stash for the border. 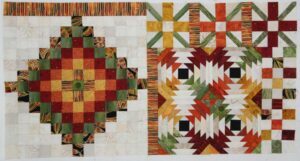 Sunday & Monday was spent working on four Pineapple blocks for the Long Time Gone quilt. I am using Marti Michell’s temples for the Pineapple blocks, but I was totally unprepared for how long it would take to piece these four blocks. There are more Pineapple blocks to make, but that will be a project for another day. 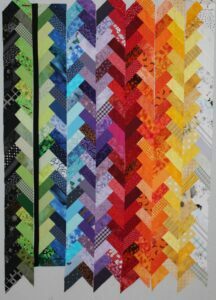 My goal this week is to finish the Rainbow Braid quilt and then back to Long Time Gone blocks – I would really like to get another section completed over the Memorial Day weekend. Lots of progress at your place. Loving the colors you are using in LTG!